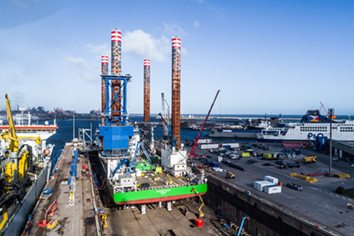 A2SEA-operated self-propelled wind turbine jack-up Sea Installer paid a visit to Damen Shiprepair Dunkerque this month as part of a short but productive eight day refurbishment project. The jack-up, which is 132 metres long and 39 metres wide, can operate in seas up to 60 metres deep, and has a total carrying capacity of 5000 tones. Built by COSCO for A2SEA, it is now owned by DEME subsidiary company GeoSea, which purchased A2SEA in 2017. 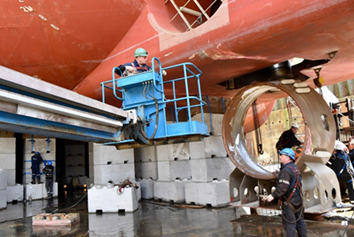 Sea Installer’s stopover at Damen Shiprepair Dunkerque was marked by the significant task of fitting four new spud cans, each weighing 160 tonnes. These are the cylindrical ‘shoes’ at the bottom of each of the vessel’s four legs featuring a pointed end that is driven into the seabed to provide stability. The complexity of the repair necessitated the use of external logistics resources, including self-propelled modular transports for the spud cans and a crawler crane capable of lifting 700 tonnes. More conventional work was also carried out, with the vessel’s bow thrusters being overhauled, its jetting system modified, and its paintwork changed from blue and white to green to reflect DEME’s branding. Following the stopover, Sea Installer is now being utilised in the installation of 42 7MW Siemens wind turbines at the Rentel wind farm, located off the coast from Ostend in Belgium. Described as ‘the ideal solution for the next generation of European offshore wind farms’, the vessel can transport and install up to eight 4MW, or four 8.3MW turbines. Sea Installer is designed to be used in the harsh weather of Northern Europe, with safety boosted by the use of a DP2-class type dynamic positioning system.